7.74 points at 39 votes (rank 141). "The huge alien sapceship ZARG has intruded our universe. As it is known, there are the armed space-controlling forces DOH on board, of which was by mistake believed that they had been eliminated in a space war that roared fortythousand years ago. ..."
As on the forerunner Arkanoid an energy ball needs to destroy blocks. 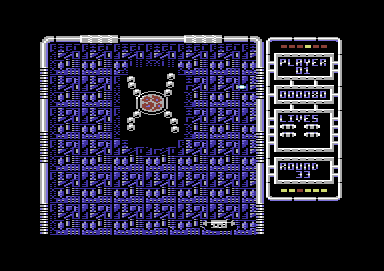 The player controls the "new" spaceship "Vaus II" and has to try to defelect the ball with the ship to stay in the game. Furthermore there are oppsing aliens, as well as blocks which differ in the easyness to get destroyed. Again there are 32 levles with concluding end boss ("Dimensions Changer") as level 33. It muss be destroyed to beat the "DOH" off again. The playing direction is from bottom to top, on a static surface. The ship can only be moved horizontally and the rebound angle of the energy beam depends on the hitting point on the spaceship. The extras can be distinguished by the colour, the aliens are properly animated. 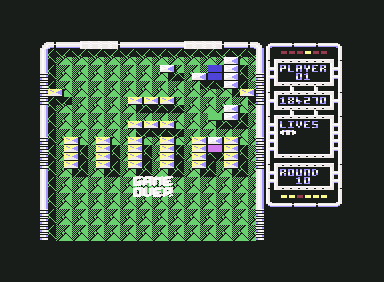 As novation compared to the forerunner there are now animated stones that move or disappear and reappear a highscore list with 99 entries, a 1 to 4 player option and the possibility to choose between two exits after solving a level. B = Backdoor to the next level. C = Energy beam (ball) keeps stuck to the Vaus II (bat). D = Five balls at the same time. E = Vaus II (bat) gets big. I = Ghost creature (moving shadow) appears behin Vaus II and can divert the energy beam. L = Laser at the Vaus II. N = Three beams (balls) at the same time, when losing one, a new one will generate itself. R = Vaus II gets smaller. T = Double appears next to Vaus II. Special capsule = random bonus. There are different options for the controls: 1351 mouse, Neos mouse, joystick and keyboard. With the mouse the bat is significantly better controlled than with keyboard or joystick, so you should definitely prefer with VICE or CCS64 the CBM mouse emulation. In level 33, the end level, you need to face the "boss" DOH. It must be hit about 40 times. In this level no extras can be gained, so you need to cope with the lives you have collecte before that. The laser is mainly suited for stones, that need to be hit several times to get destroyed. With the help of the outmost ridge of the space ship (bat) the energy ball can be deflected in an extremely acute angle. This is especially helpful, when you need to manoeuvre on limited space. FXXS: "It is a matter of taste which Arkanoid one likes better. Graphics and sound are a bit different, but not implicitly better, the gameplay is a bit harder than in the forerunner. Due to the several gimmicks it get from me just under 9 points." TheRyk: Though graphics and sound are good in both versions, RoD is definetely the worse Arkanoid to my mind. If you take the upgrades (or should I say 'downgrades' in case of that 'R'? ), some seem to be quite nice at first glance, but are more or less superfluous if you take a closer look, e.g. 'T' and 'I' are not so much different from the 'E's. Extra-Lives do not come as easy as in Arkanoid and the level design is simply trash if you ask me. Though you can learn to avoid certain super-difficult levels, especially the first 6 screens should be much easiert. 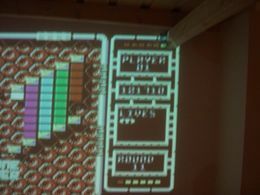 6 Points because it might be an alternative every now and then if you have played Arkanoid and Krakout too extensively." 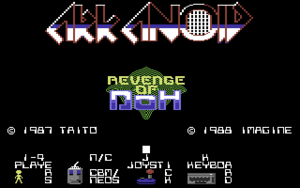 "Arkanoid: Revenge of Doh" is the official successor of Arkanoid. All other games as "Arkanoid II", "Arkanoid III" , "Arkanoid IV", "Arkanoid V", etc. 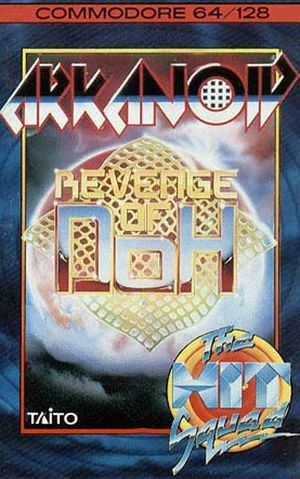 are fan mods of "Arkanoid" and no official releases. For the game console SNES the successor "Arkanoid: Doh It Again" was also released. 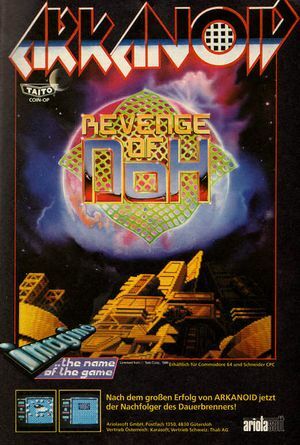 Arkanoid - Revenge of Doh in the Killer List Of Videogames. This page was last modified on 5 March 2016, at 16:57.